If you think Switzerland is all about watches, holey cheese, and financial bankers, maybe it’s time you actually went there for a visit. If you’re questioning why you should, let’s just answer one or two of those doubts which are crossing your mind. No, Switzerland isn’t just about snowboarding or skiing down alpine slopes. Yes, they do manufacture some of the best chocolate in the world. Which in itself, is quite probably reason enough to get on a plane and go there without too much in-depth contemplation. Is there anywhere to visit other than chocolate factories or anything else to do other than going on the piste? Yes, there is. Just check out these fourteen amazing places to visit in Switzerland and it won’t be long before you’re purchasing your flight ticket. Is there anything exciting about a medieval bridge constructed over four hundred years ago? Only if it’s the Ponte Dei Salti Bridge in Valle Verzasca, Switzerland. Salti literally translated to English means jump. It’s now starting to sound quite interesting, isn’t it? Along with the fantastic rock formation of the Valle Verzasca, the unusual shape of the double arches makes it a great photography subject, but what puts it firmly on this list is the fact you can leap off the bridge into the crystal waters below. It’s just a ten metre drop, no bungee rope provided, so its a real adrenaline trip. When to go: If you’re planning on jumping off the bridge then go when the water’s had a chance to warm up. Late spring through to summer is the best time, but be prepared for some crowds when the weather’s good. It’s a popular place to visit. Pro Tip: If you don’t like heights, you might want to think twice about jumping in. It’s a long drop. If you’ve ever fancied strutting your stuff across the ramparts of a medieval castle pretending you’re a knight in shining armour or a damsel in distress, you really need to visit Gruyères Castle, in Gruyères, Switzerland. This almost eight hundred year-old structure might look as if its dropped straight out of a fairy tale, but its historic past is enough to make your blood curdle. As you explore the castle’s interior, you’ll be completely grossed out by the mummified hand exhibit. Yes, it’s a real one, but nobody has any idea who it belonged too or where the rest of the body is. Ponder on that while you wander onto the battlements to take in the stunning mountain views and if you get a whiff of cheese, you won’t be imagining it. Gruyères is also famous for producing some very tasty versions of it. When to go: If you like your castles with a dusting of snow then go in the winter, but wrap up warm. Best time to visit is spring and summer when the temperature’s had a chance to rise above freezing and the mountain flowers are in bloom. Weekends can be over crowded so, if you can, visit Gruyères Castle during the week. Pro Tip: When you’re in Gruyères, don’t miss popping into the HR Giger museum which is dedicated to the artist who created the alien in the film Alien. His macabre art will make any sci-fi fan’s heart sing as will the surreal interior of the Giger Bar next door if you pop in for a quick drink. If you’re going to tell someone to take a hike, then tell them to take it around Oeschinen Lake in Switzerland. There’s no place more beautiful or with purer air for a walk or for taking a picnic than by the pine-forested shores of this enormous stretch of water. Sound too sedate for you? It won’t be. Apart from being a major area for cross country skiing when snow lays on the ground, this alpine location is 1500 metres plus above sea level. Take the dizzy ride up on the cable car then ride back down on the toboggan run for the longest, most hair-raising slide of your life. When to go: If you want to participate in winter sports then don’t go in the spring or summer. In winter the lake freezes over and you can skate, walk across it or go ice fishing for your dinner. The warmer months are better for hiking. Pro Tip: If you’re planning to hike up or around Oeschinen Lake, make sure you’re wearing the correct footwear. You’ll need it. There are small mountain huts higher up the trails where you can rest or shelter from bad weather if need be. We all know someone who is good at spouting off, but even the best will have trouble competing with the Jet d’Eau fountain spout in the Swiss city of Geneva. This mega water-jet blasts into the air for a staggering one hundred and forty metres. That’s the equivalent height of thirty two double decker buses stacked one on top of the other. It’s certainly not your average shower flow either as it uses around five hundred litres of water every second to be able to reach that amazing height. When to go: The Jet d’Eau spouts all year round but is twice as spectacular when its illuminated so take an evening stroll around the harbour for the full effect. Pro Tip: Geneva is not renowned to be the most economic city to visit. If you’re on a budget and want to see the Jet d’Eau from a boat, check out the Lake Geneva water-buses, Mouettes Genevoises, which sail past it on their regular, low-priced, lake crossings. If you’ve ever wanted to replicate the pioneers of old and go panning for gold, you’d probably be thinking you’d need to fly to the States to do it. Well, wrong. You can also do it in the richest country in the world, Switzerland and you get to keep your findings too. The Ruinaulta, Rhine Gorge or Switzerland’s Grand Canyon, whichever name you prefer to call it by, has the sort of rugged landscape which will really appeal to your explorer’s nature. Trek through the gorge, go white water rafting on the raging flow of the Rhine river or pan for those golden nuggets in the shallows by the shore. Whatever you do while you’re there, you’ll feel like a real adventurer. When to go: Unless you like your scenery covered with a blanket of white and don’t mind sub-zero temperatures, visit Ruinaulta from April through to September. Pro Tip: If you’re really not in rafting or trekking, there’s a train which runs through the gorge. Is one waterfall better or more impressive than another? It is when it’s the Staubbach Falls in the alpine village of Lauterbrunnen in Switzerland. Why? It’s the most talked about, most photographed and has the largest cascade of all the seventy-two waterfalls in the Lauterbrunnen Valley. If you want to get up close and feel the spray of this famous waterfall on your face, all you have to do is make the, not too challenging, hike up to the Staubbach Falls Gallery. Though take some earplugs with you as the rush of water is pretty deafening. When to go: Go when the sun is shining. The touch of winter often turns the Staubbach Falls into one, gigantic hanging icicle. Pro Tip: Lauterbrunnen has become quite a renowned spot for those who like to participate in the sport of base jumping. If flying through the air is of more interest to you than watching falling water, you need to know, you leap from the cliffs completely at your own risk. Have you ever wanted to time travel rather than take a normal holiday? If you have, you really should put Old Town Bern on your list of places to visit in Switzerland. You won’t need a time machine to go either. This medieval nucleus nestles at the heart of Switzerland’s capital city, Bern. Almost cut-off from reality by the winding oxbow of the Aare river, it’s just not caught up with modernity and is perfect for experiencing first hand just what life might have been like in the twelfth century. When to go: For a fun and unusual visit to Old Town Bern go when it’s carnival time. The dates vary every year, but plan for around the end of February or the beginning of March to catch the major parades. Yes, people really do dress as bears and go roaming the streets mingling with the other carnival revellers. Or, if you’re a jazz fan, then you just have to go between March and May. Old Town Bern will hit just the right note for you during its two month long jazz festival. Pro Tip: If binging on history is your thing, check out Old Town Bern’s Museum Night. Also in March, usually on a Friday, just one single entrance ticket will you get you admission to up to forty different museums. If you’ve ever wanted to have a crack at yodelling, Lake Brienz in Switzerland could be the ideal place to give it a try. The pristine blue of the alpine lake is surrounded by the perfect backdrop of mountain peaks to attempt to reverberate your voice off. If yodelling is not your thing, take a boat ride across the glassy waters or hike the hill and get close up to Giessbach Falls. The landscapes here are so stunning that even if you’re not an artist, you may still be inspired to paint them. When to go: As cold as it might be, and think glacial, winter is a great time to visit Lake Brienz. It’s a lively hub of winter sport activities ranging from kayaking to snowboarding, ice skating and skiing. You can also go night sledding and follow that with a traditional and very warming cheese fondue. Sounds good, doesn’t it? Pro Tip: Lake Brienz might not be a summer sun destination, but you’ll still need to take some sunscreen with you to prevent snow burn. Make sure you pack the right clothing too. 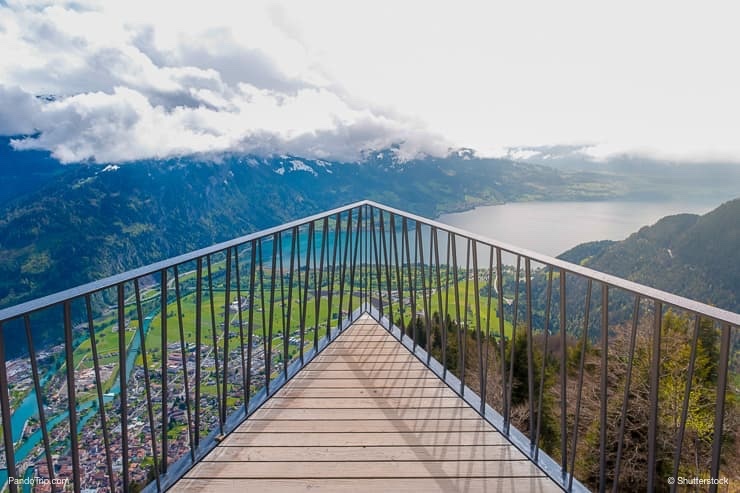 You’re going to need a serious head for heights if you’ve added the Harder Kulm to your list of places to visit in Switzerland. No beating about the bush, if you don’t have one, you might want to scroll on to place number five on the list, because just reading about this place will make you dizzy. If you’re brave enough, take the cable car up for over a kilometre then step out onto the footbridge to look up to the famous Eiger, which overshadows all the other peaks, then down onto the lakes of Brienz and Thun far below. The altitude will leave you completely mind-boggled. When to go: The footbridge and restaurant at the top are only open from April through to October as is the cable car. Late May through to early September is better when the days are clearer and you get the full impact of the incredible view without cloud coverage. Pro Tip: The higher you go the colder it gets. Take a jacket with you even in summer, you’ll be pleased you did. If you’re thinking, oh no, not another medieval Swiss castle, well you’d basically be right. But the Château de Chillon, on the shores of Lake Geneva in Switzerland, has a lot more to offer than dungeons and historical exhibitions. It has wine. Very good quality wine, which shines a different light on things, doesn’t it? Apart from the amazing exhibitions in the Château de Chillon, which include graffitti by none other than the 19th century poet, Lord Byron, the chateau has its own vineyard and after a tour round the medieval artefacts, you’ll get to indulge in a glass or two of the delicious Clos de Chillon which they produce. When to go: The Château de Chillon closes its doors early during the winter months, so if you want a leisurely visit go from April through to September when it’s open until 7pm. All folklore, myths and legends originate somewhere and Mount Pilatus in Switzerland is well known for inspiring more than a few. So if you like tall stories as well as stunning scenery, this is a place you’ll just have to visit. Reputed to have once been inhabited by dragons, though none have been spotted recently, it does have the world’s steepest cog railway which you can ride on to get to the top. The seriously steep angle of ascent is scarier than many roller-coaster rides so be prepared. When to go: Go between April and October. As soon as snow starts to fall then the mountain shuts down for safety reasons. Pro Tip: There are several hikes of varying difficulty around Mount Pilatus, but make sure you go with a professional guide if you’re considering doing the trickier ones. Seen one waterfall seen them all? Not true. If you’re in Switzerland, you really should take in the magnitude of the Rhine Falls, one of the not-to-be-missed waterfalls in Europe. The best way to do it? On a boat ride which gets up close to the tumultuous waters that cascade over the rocks of this one-hundred and fifty metre wide wonder of nature. There’s more than just a major flow of water at the Rhine Falls too. The falls are overlooked by the enormous castle Schloss Laufen which you need to cross an arched viaduct to reach, but what will really grab your attention is the fantastic activity centre, the Rhine Falls Adventure Park. Yes, you really can zip-line for half a kilometre, on the Panorama Express, to see the falls from a completely unique angle. It’s wild. When to go: You can view the falls all year round and twenty four hours, there’s really only one day when you really should be there. Go on the 31st of July when the Rhine Falls Firework Display lights the night sky above the falls. It’s truly amazing. There are many famous mountains and then there are mountains which are iconic. The Matterhorn in Switzerland is one of the latter. In truth it’s not just a mountain, but more of a monument to the people who have died trying to climb it. The Matterhorn stands at a colossal four and a half thousand metres plus high from its base to the summit of its four-faced pointed peak. While you might not be contemplating climbing the Matterhorn, scale some heights by taking a ride in Europe’s highest cable car to view all thirty-eight alpine mountains and get a closer look at what makes the Matterhorn so memorable. When to go: As famous as it is, the Matterhorn is just a rather large lump of rock, so why not combine going to see it with a great skiing trip? There’s enough snow even in summer! Pro Tip: If you can’t go up it, you can go round it. Plan on taking at least two weeks holiday to do it as trekking round the base of the Matterhorn takes around ten days. 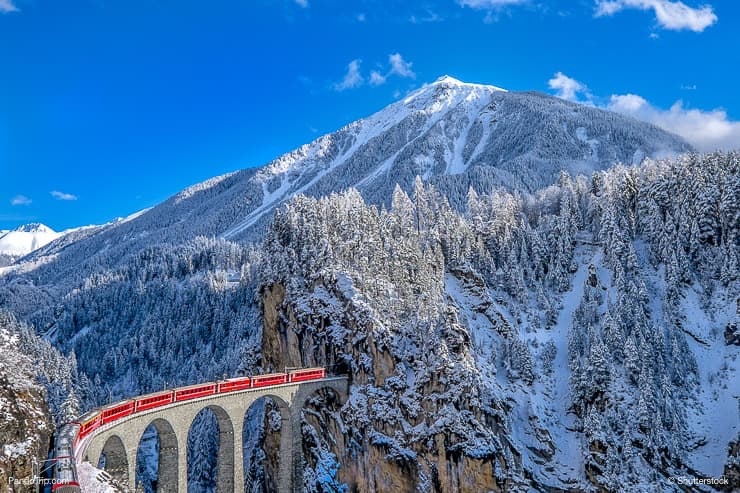 Some man-made structures defy definition and the Landwasser Viaduct bridge in Switzerland is one of those. Its monumental arches, all six of them, which curve sixty-five metres high above the Landwasser river, are even more amazing when you consider they were built almost two hundred years ago. They really are an incomparable feat of engineering and architecture which needs to be seen to be appreciated. Ride over them on the Glacier Express by jumping on at Chur Station, in the direction of St Moritz. See if you’re brave enough to look down before disembarking in Filisur. When to go: Mist can obscure the Landwasser Viaduct from view when the weather is cold and although it looks great with a coating of snow, it’s much better to visit in the summer. Pro Tip: If you prefer to look up to this incredible bridge or want to take a photograph of the Glacier Express going over it, there’s a view point at ground level which is reachable from a car park nearby. There’s also a trail you can hike along from Filisur Station, but only do it if the weather is decent.